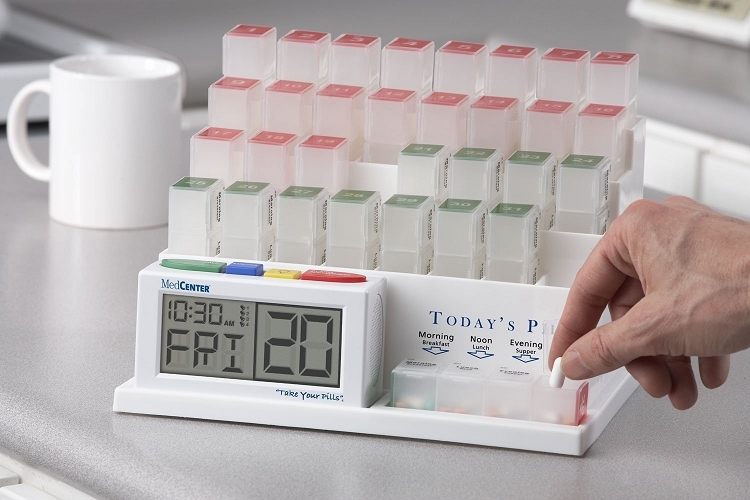 Set up to 4 daily alarms to alert you when your medication is due. 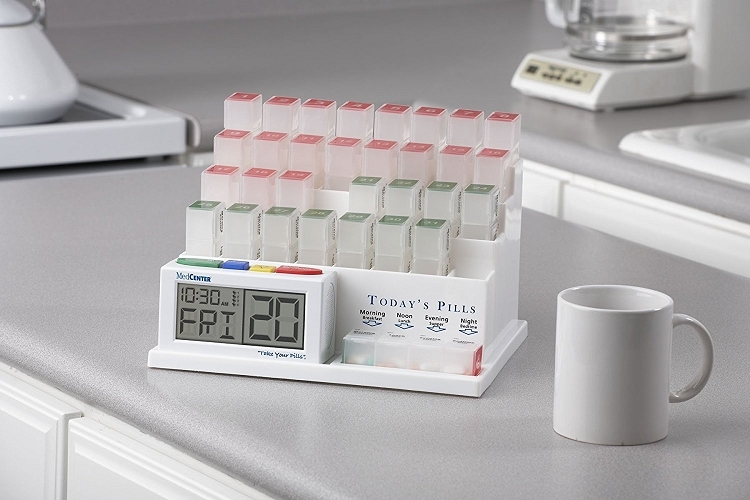 A repeating friendly reminder notifies you of the time, the date and which daily dose to take. ("good morning please take your morning pills for the 20th.") 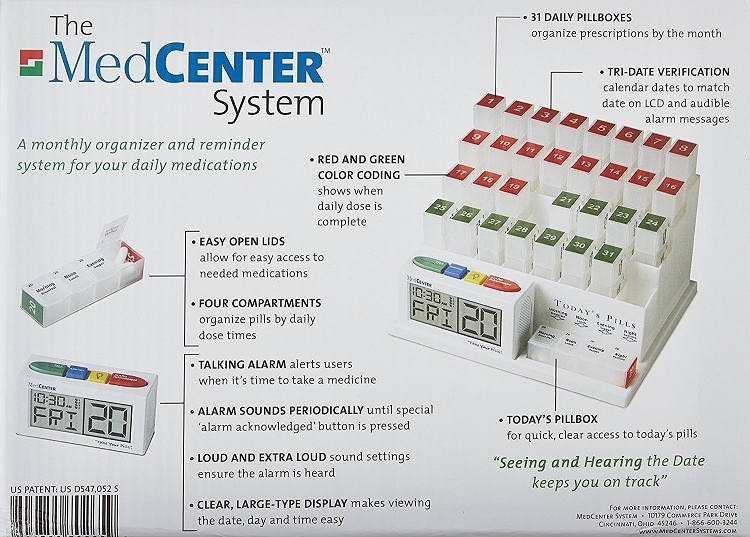 press the "alarm acknowledged button" to confirm compliance and the MedCenter talking alarm clock tells you when the next daily dose is due. 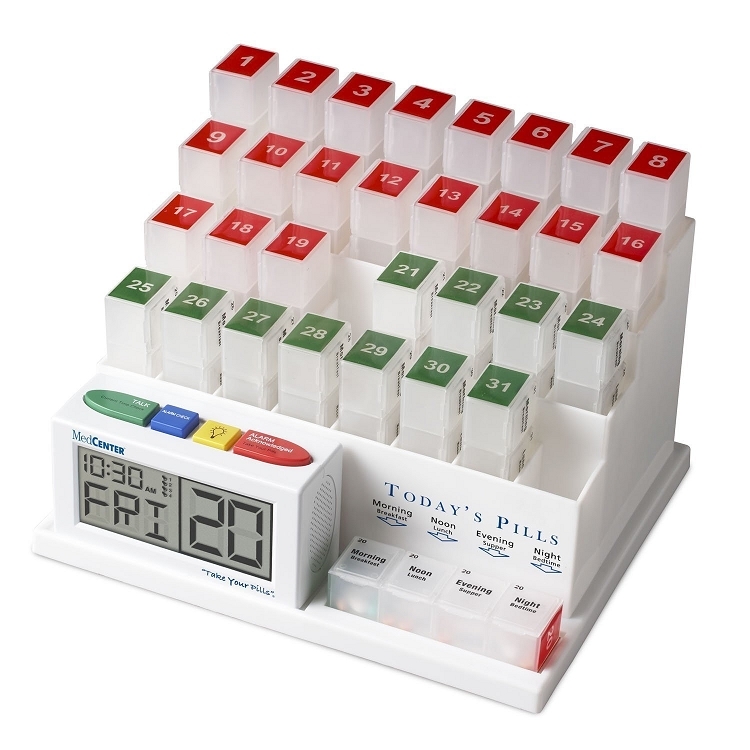 Tri-date verification: Matching the visual dates on pill boxes and clock with audible alerts assures accuracy talking alarm alerts users when it's time to take medication set up to 4 alarms daily to alert you when your medication is due loud & extra loud sound settings ensure the alarm is heard red & green color coding shows when daily dose is complete the standard pill box (included in the MedCenter system and all other standard MedCenter organizers) has an individual dose compartment which measures roughly 15/16" wide x 1" long x 3/4" deep on the inside. Each pill box contains four of these dose compartments. Because pills and vitamins differ greatly in overall size, in order to better answer the question of how many pills/vitamins will each pill box hold, we calculated the amount of Advil and M&M candies would fit in each compartment and pill box: Standard pill box=(16) Advil per dose compartment or (64) Advil total per pill box or (10) M&M candies per dose compartment or (40) M&M candies per pill box.